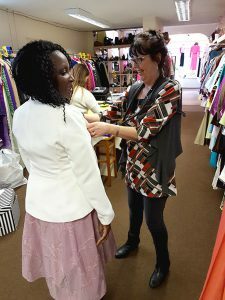 Butterflies Dress Agency & Boutique are a ladies pre-loved dress agency and specialise in some of the most exquisite ladies second hand designer clothing. We sell many types of dresses for all occasions. Located near the centre of Northampton, we are situated in a large, bright and spacious shop with easy parking directly outside. Selling pre-cherished designer wear from Condici to Vivienne Westwood, in sizes from UK 6 to 28. We have everything to suit your needs; day wear, ballgowns, prom dresses, mother of the bride outfits, wedding dresses, evening wear and more. We also have a fantastic range of jewellery, accessories, handbags and shoes to complete your outfit. Come in and browse, you will find even more items available in store and can expect a warm welcome every time. 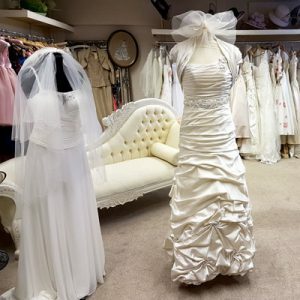 Want to sell your wedding dress? Is your designer shoe collection taking up too much space? Butterflies sell selected ‘as new’ designer products on behalf of customers, taking a 50% commission of the selling price. Please contact us for further information. Fallen in love with an item of clothing that isn’t your size? Does something you own or have tried on not fit quite right? Butterflies offer an in-house alterations service provided by professional seamstress Kristina. Visit us in store or call us on 01604 717017 for further details.